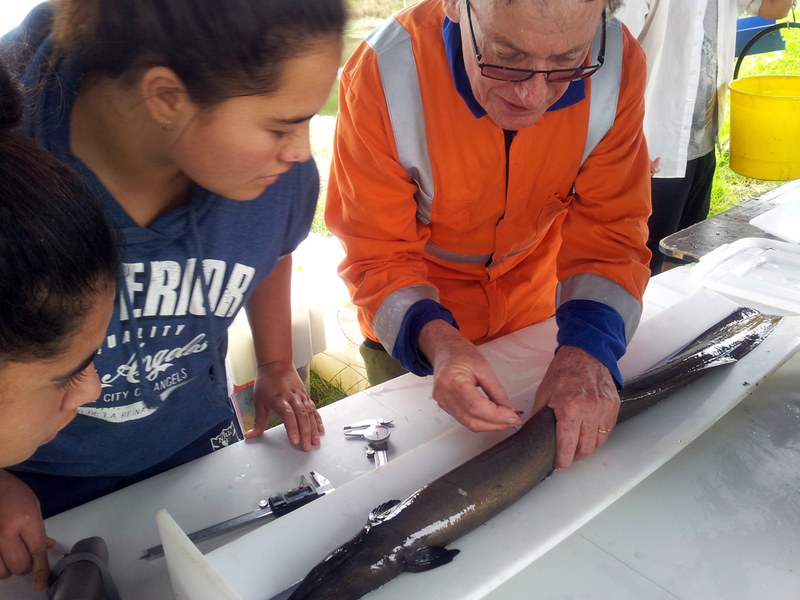 For the past four years, Whanganui local hapu, Ngā Kaitiaki O Ngā Wai Māori, have been working alongside NIWA, tagging and monitoring the movement of young eels and tuna. Results and recommendations for the future of this work were recently shared at a hui, which included representatives from Mangakahia Area School, Wairua Power Station (Northpower), tuna fisherman, and Living Water, a partnership between Fonterra and Department of Conservation (DOC) to improve water quality in the Hikurangi catchment. “The future success of this project lies in the collaborative efforts of all parties. While we acknowledge the work completed so far, we know we cannot move forward without key partners involved. It was great to get the support from the Living Water project for future work, and wonderful to see the future generations here learning,” says Allan Halliday, Ngā Kaitiaki O Ngā Wai Māori . “This project, and this activity, is what Living Water is all about. Supporting the Hau Kainga (local hapu) to do work that they initiated and lead; using NIWA science expertise; getting school kids engaged and hands on, while aligning with our own biodiversity improvement goals. It’s brilliant,” says Tim Brandenburg, North Island Project Manager, Living Water Partnership, Fonterra. 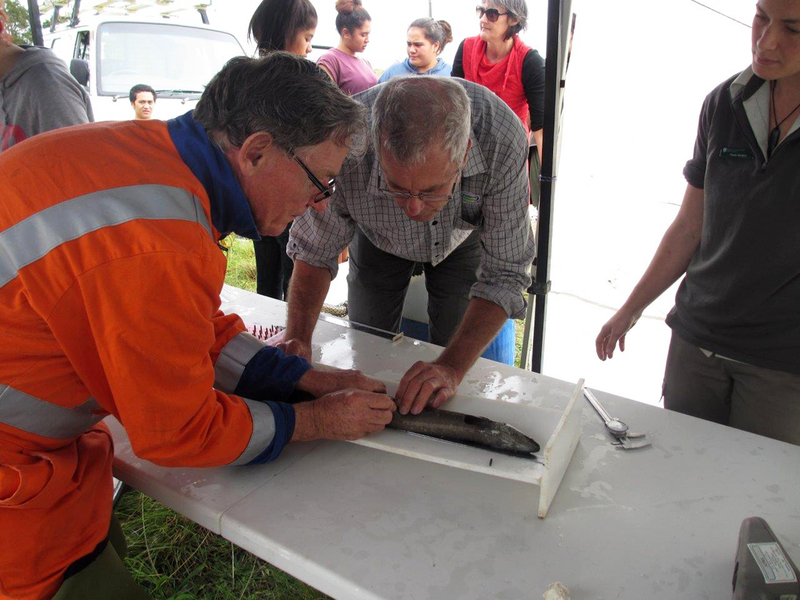 “Northpower has been working and collaborating with a number of groups and individuals to improve the upstream migration of elvers (juvenile eels) and downstream migration of mature eels, past the physical impediments of our hydro scheme. “Northpower will continue to support, and be an active member of, this collaborative group which is making great progress in this unique project,” says Bill Grimes, Generation Manager for Northpower. Northland is the most productive tuna fishery in New Zealand, due to the retention of quality wetlands, however, some of these have disappeared. Many waterways are behind stop banks, flood gates and flood pumps and have low water quality; this is affecting the health of tuna. The tuna monitoring project is the only way of determining growth rates without having to kill the tuna and can determine tuna density and movement. The collaborative effort to protect tuna and improve tuna fisheries includes farmers, commercial fisheries, Ministry of Primary Industry, Nga Kaitiaki O Ngā Wai Māori, Ngāti Hau Trust Board, NIWA, Northland Regional Council, Northpower, Te Parawhau ki Korokota and Whangarei District Council. Some of the recommendations presented by Dr Jacques Boubee, NIWA Freshwater Fish Ecologist at the hui included continued trap and release of adult tuna, improvements to downstream tuna passage, improved and increased tuna habitat and that all catchment managers are actively involved in the recommendations. Living Water is a joint programme between DOC and Fonterra. Working together with local communities , farmers, iwi and stakeholders the aim is to improve water quality and biodiversity at five key waterways in significant dairying regions around New Zealand.